Ah, January 1: a day of fresh starts, new beginnings, and big dreams. According to Fidelity’s Tenth Annual New Year Financial Resolutions Study, 32 percent of survey respondents are considering making a financial resolution for the year ahead. The top three financial resolutions are to save more (48 percent), pay down debt (29 percent) and spend less (15 percent). While those are great resolutions, they also are broad and lack detail. How much do you want to save? Which debts will you pay down first? How exactly will you spend less? Without a firm plan in mind, these resolutions easily may be forgotten by the time Valentine’s Day rolls around. 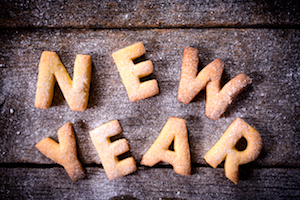 When it comes to New Year’s resolutions, it’s important to set specific, measurable, and achievable goals. In other words, you want to create a detailed plan with milestones that can be met. That way you will see the progress you’re making throughout the year and maintain the motivation to keep going. With that in mind, here are a few smart money moves you can make in the coming year. Check your credit report. This one should be a no-brainer, but many people put it off until trouble arises. Don’t wait until you’re ready to apply for a car loan or home mortgage; get your free copy of your credit report at AnnualCreditReport.com months in advance so you can address any discrepancies. You can request a free copy of your report once a year from each of the three major credit reporting companies. Keep in mind that you can order the three reports one at a time, allowing you to check your report multiple times throughout the year. Once you get your copy, review it and make sure all the information is accurate and up-to-date. Make sure your insurance meets your needs. How much life insurance do you need? Do you need disability insurance? What about long-term care insurance? These aren’t easy questions to answer, and the answers generally depend on your individual situation. While determining the type and amount of insurance you need can be overwhelming, it’s a vital part of protecting you and your family. Generally speaking, it’s easier to pay a little bit each month in premiums than to come up with a large sum in the event of an emergency. Get the best credit card for you. Whether you use your credit card only for major purchases or put everything on it and pay it off each month, it’s important to make sure the card in your wallet is the best one for your needs. If you have to carry a balance sometimes, you want to make sure you use a card with the lowest rate possible; if you travel a lot, you’ll want to look for a card that’ll make your vacations a little more affordable. Sites like NerdWallet and WalletHub can help you find the credit card that best meets your lifestyle. Fully fund your emergency fund. Make this the year you build your emergency fund to the recommended six to eight months of living expenses. It sounds difficult, but remember, we’re talking about your monthly expenses, not your monthly salary. Calculate the amount based on your true necessities: mortgage/rent, utilities, food, insurance, and the like. If it helps keep you going, break this goal down into smaller milestones you can meet throughout the year, and celebrate each accomplishment along the way. Put all your financial documents in one safe place. Last but not least, take the time to gather together all your important financial documents and store them in a secure place. InsureYouKnow.org is the ideal location. Think of it as an easy-to-use electronic safe deposit box; you upload your documents, and only you and anyone you share your password with can access them. Thanks to Amazon’s cloud encryption, you can rest easy knowing your documents are safe and easy to access whenever and wherever they’re needed.